Chances are you've heard of the fabulousness that is Space NK. But just in case you're not aware of this outpost that's taken over the beauty world ... you can find brands like By Terry, Laura Mercier, NARS and so much more at this modern version of an old-time apothecary. Not to mention the house line, which has myriad lovely scents that are available in candles, body washes and lotions. And the mastermind behind it all? Beauty genius Nicky Kinnaird. Born in Belfast, she graduated from Reading University as a Chartered Surveyor and moved to London to begin her career in property investment. 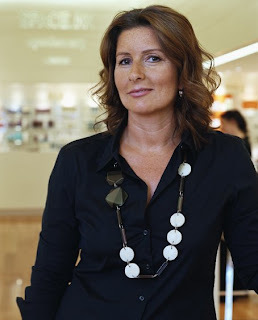 Soon enough, her passion for shopping led to her working as a consultant for the retail industry -- and in 1993, she opened her first Space NK location in Covent Garden. Read on to discover even more about the fabulous Nicky Kinnaird. How did you first become interested in beauty, and what led you to opening up Space NK? Always curious and with a distinct passion for discovering innovation, I opened my first Space NK shop during a time when there was a true sense of dissatisfaction in terms of retail offerings. I didn't see why beauty should be separate from fashion -- if a consumer was interested in seeing the latest trends off the catwalk, they should have simultaneous access to the latest haircare and color cosmetics. Until this point, beauty products were primarily available at department stores or High Street drugstores in the UK and I didn't find any one brand in the market that satisfied all of my needs. I thought that by creating a space where the best brands and products from innovators and experts were available was an obvious solution -- a place where you found a sales team comprised of highly trained makeup artists and skincare specialists capable of providing unbiased advice, specifically customized to the individual. When did you open Space NK, and how did it grow from an idea to reality? We opened the first shop in 1993 and it was a blend of fashion accessories, clothing, design objects, a juice bar and a beauty apothecary. The beauty retail space soon grew from 250 square feet to 1500 square feet within 3 years. Out of 300+ brands of fashion, beauty and design objects that I carried, I saw the most potential in the apothecary area and decided to focus my future efforts here. 1) Launching the original Space NK apothecary in the Covent Garden area of London in April 1993. 2) Working with my friend and talented perfumer Chris Sheldrake on our signature fragrance -- Space NK Laughter -- that launched in September 1999. 3) Opening our first US flagship boutique in NYC on Greene Street in June 2007. 4) Launching our shop-in-shops at select Bloomingdale's stores in October and November 2008. NARS Duo Eyeshadow in Madrague. Using the darker shade to fill in brows and used wet as an eyeliner. 1) Less is more. Emphasize or "play up" only one feature on your face at a time, such as a dark smoky eye or high-pigment lip. 2) Take time to find your perfect base. Remember that you will need a variation of shades and textures according to your location and season. 3) Brush quality matters. Buy the best quality brushes that you can afford. Also, make sure that a makeup artist shows you how to use each brush to get the most from your investment. When we recommend a new regimen to a customer and that person becomes a repeat customer ... it is then that I know that we did our job right. Playing with beauty products must be fun -- but what do you do for fun in your spare time? I love a good tennis match and have a keen interest in the art and design world. Check out spacenk.com to discover even more about the brand and find a store near you.